Piotr Kłodkowski Islam in India: Ideological Conflicts on the Subcontinent and Their Political and Social Consequences in the Early 21st Century Indias political coherence largely depends on New Delhis ability to build a system of cross-cultural compromises among various communities. While the Muslim minority has lived and prospered in India for more than one thousand years, its relations wit h the Hindu majority have not always been harmonious. The partition of India in 1947 became a political reference point for many radical politicians interested in inciting communal conflicts that bring them political gains. Indian Muslims remain an ethnically and ideologically divided community and have not succeeded in setting up one political party in independent India. They are usually represented by regional parties in different states, but in all-India elections they frequently vote en bloc for the Indian National Congress, which is commonly perceived as a secular party opposed to extremist Hindu ideology. 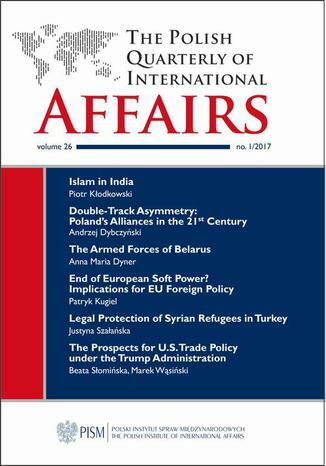 The author briefly analyses the history of Indian Muslims, presents the political consequences of the Two Nations theory and explains the reasons behind inter-religious clashes in contemporary India, predicting that the position of Indian Muslims will become a subject of fierce political debate in the years to come. Andrzej Dybczyński Double-Track Asymmetry: Alliances of the Republic of Poland in the 21st Century In the last quarter century, Poland has been one of the foremost beneficiaries of the post-Cold War international order, but its 30 years of uninterrupted development now seem to be drawing to an end. The disadvantageous and largely unpredictable changes in Polands internal and external environment impart special relevance to the question about the methods and means to ensure the security of the state in the years to comesecurity which until now seemed guaranteed. One way to achieve this is to conduct an effective alliance policy, understood as selecting allies and building relations with them is such a way that will add to the security of the state and discourage an enemy from open aggression. Hence the urgent need for Poland to formulate a more sophisticated alliance policy than the existing one. This concerns not so much the choice of allies (in this respect, the room for manoeuvre is relatively limited and the choices fairly obvious) as, first and foremost, the way it functions within existing alliances. The text outlines the determinants to which Polands alliance policy will be subjected in years to come and suggests how this policy should be shaped based on the authors analysis of Polands security environment and its foreign policy as well as on his research into the phenomenon of alliances as such. Anna Maria Dyner The Armed Forces of Belarus The annexation of Crimea and the war in eastern Ukraine have significantly altered the security infrastructure in Eastern Europe and impacted the Belarusian authorities, who have begun to pay more attention to the condition of their countrys military. The text examines the structure of Belarusian armed forces and their military relations with Russia. Regional defence alliances, such as the Collective Security Treaty Organisation (CSTO) or military cooperation (joint exercises and industrial cooperation) between Belarus and its allies are also reviewed, along with the condition of the Belarusian armed forces and their ability to defend the countrys territory. Patryk Kugiel End of European Soft Power? Implications for EU Foreign Policy Three developments in 2016 led to the EU losing a lot of its soft power, constraining its ability to exert influence on third countries. An evolution in its response to the refugee crisis, rising Euroscepticism and populism in Europe, and the Brexit referendum have all undermined the European project and image of the EU as a political model and global norm-setter. Though the EU still retains much strength, it must rethink how it uses its power, acknowledge the limitations, focus on rebuilding its credibility, and pursue more a pragmatic and modest foreign policy. Justyna Szałańska Legal Protection of Syrian Refugees in Turkey against the Background of International Legal Determinants Recent UNHCR data show that nearly 3 million Syrian refugees have fled to Turkey, where they are not recognised as refugees. Turkey has, however, adopted a new law to offer Syrians temporary protection, which means a residence permit, access to education, health care and employment, but also an opportunity to acquire Turkish citizenship on certain conditions. This text focuses on the current regulations for the protection of Syrian refugees in Turkey, outlining the legal status of refugees and examining the impact of their influx on the Turkish policy towards asylum-seekers from non-European countries. Beata Słomińska, Marek Wąsiński The Prospects for U.S. Trade Policy under the Trump Administration A reform of U.S. trade policy was among the priorities of Donald Trumps campaign. Guidelines of the new policy developed by Secretary of Commerce Wilbur Ross and Peter Navarro, head of the National Trade Council, were then included in the Presidential Trade Agenda for 2017. A lower trade deficit is a key target seen by the new administration as a prerequisite for boosting economic growth. Duties and taxes are to be introduced to countervail unfair practices, which are among the sources of the deficit. The new administrations preference for bilateral rather than multilateral agreements is reiterated. Keeping with his campaign promises, Trump has signed executive orders to withdraw the U.S. from Trans-Pacific Partnership and to renegotiate the North American Free Trade Agreement. David Cadier Why France and Poland (Should) Need Each Other If European politics is seen as an amusement park, Franco-Polish relations would be a roller coaster and a house of mirrors. Over the last three years, bilateral relations between Warsaw and Paris went from one of its highest to one of its lowest points in recent history. The causes and manifestations of the current tensions in diplomatic and political relations are well known. They should not, however, overshadow the substantive economic links and vibrant cultural ties between the two countries. Nor should they lead to discarding or underestimation of the potential that closer strategic and political relations could bear. Agnieszka Szpak International Solidarity as the Basis for Millennium/Sustainable Development Goals The paper depicts international solidarity as the pillar on which the implementation of the Millennium Development Goals (MDGs) and Sustainable Development Goals (SDGs) should be based, along with international cooperation and humanitarian and development aid undertaken within the process, thus contributing to human security and global peace. The implementation of the MDGs and SDGs will help close the gap between economically developed countries and developing ones. Humanitarian and developmental aid as specific forms of international cooperation based on international solidarity and rendered in accordance with the UN Charter are necessary tools to build peace and development, and, as a result, to solve many crises, such as mass migration. Ebook porusza temat Polish. Jedną z istotnych spraw poruszanych w ebooki jest: Quarterly. Jeśli interesuje Cię: International, to ebook dla Ciebie. Dużo wiedzy na temat: Affairs w formacie EPUB, MOBI i PDF. Hasło przewodnie tego ebooka to 1/2017.